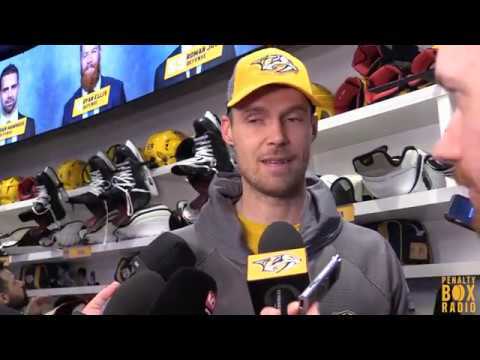 In trying to summarize why the Nashville Predators could not beat the Dallas Stars in Game One of the Western Conference Quarterfinal on Wednesday night, Head Coach Peter Laviolette boiled things down to a simple element of the game. “They were quicker than us,” he said. Most of the issues that plagued the Predators in the 3-2 loss to the Stars stemmed from a difference in pace, particularly in the second and third periods in which the Stars owned long stretches of possession. All three Stars goals were generated in some form from the blue line, and also came as a result of sustained zone pressure. Even if the shooting defenseman didn’t score, the Stars infiltrated the crease area and were able to tuck home a big rebound off the stick of Mats Zuccarello for what would become the game-winning goal. Those types of goals will warrant some adjustments from the Predators’ defense. This heat map from Natural Stat Trick demonstrates how the Stars were able to generate offense thanks to sustained zone time. Their scoring chances were concentrated in two places: above the face-off circles and directly in front of the crease. That means the Stars’ defensemen were putting shots towards the goal, and when they didn’t get through, a forward got to the rebound and generated a secondary scoring opportunity. The map does not include Dallas’ first goal off of a Miro Heiskanen shot on the power play, but that one also came from above the circles in the slot. When those defensemen keep possessions alive at the blue line and continue to put pucks in dangerous areas, it can wear a defense down, particularly at the end of a long shift. The Predators got into desperate defending situations a few too many times in this loss. While this certainly was not a must-win game for the Predators, they now face a 1-0 series deficit in the first round of the Stanley Cup Playoffs for the first time since 2015 and more desperate situation in Game Two. Unlike the regular season, there are no more lethargic offensive teams to face. The same Stars team will try to come out and do the same thing on Saturday night in Game Two, and the Predators will be tasked with finding a way to keep their defensive zone a bit more clear.